Ch 3 (counts as first dc), turn. 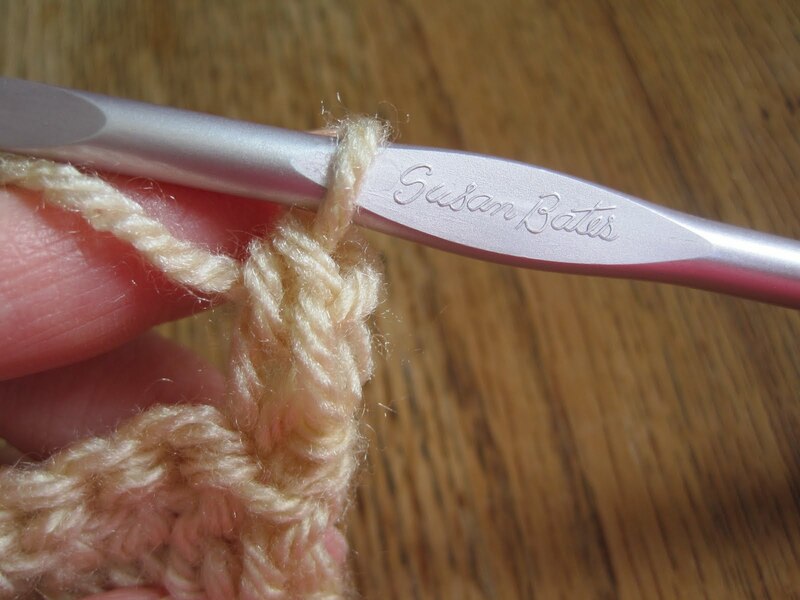 These are some of the most familiar words in the crocheter's language. They signal the end of one double crochet row and the start of another. That chain 3 works to get your yarn up to the proper height for the next stitch. It's also (in my opinion) a fiendish ploy designed to drive the stitcher crazy. You know what I mean - you've been there yourself. You're zipping along, you and your hook, dancing through the yarn and crocheting like the dickens, when all of a sudden you reach the end of the row. Screech! The happy momentum comes to a crashing halt as you poke around in the turning chain, looking for the right place to put your last stitch. That lovely little chain-3 has tightened up so much it practically requires surgery to get your hook through. And which part of the chain do you stitch into? Front loop? Back loop? Both? How about the back loop and back bump? And that's not all. 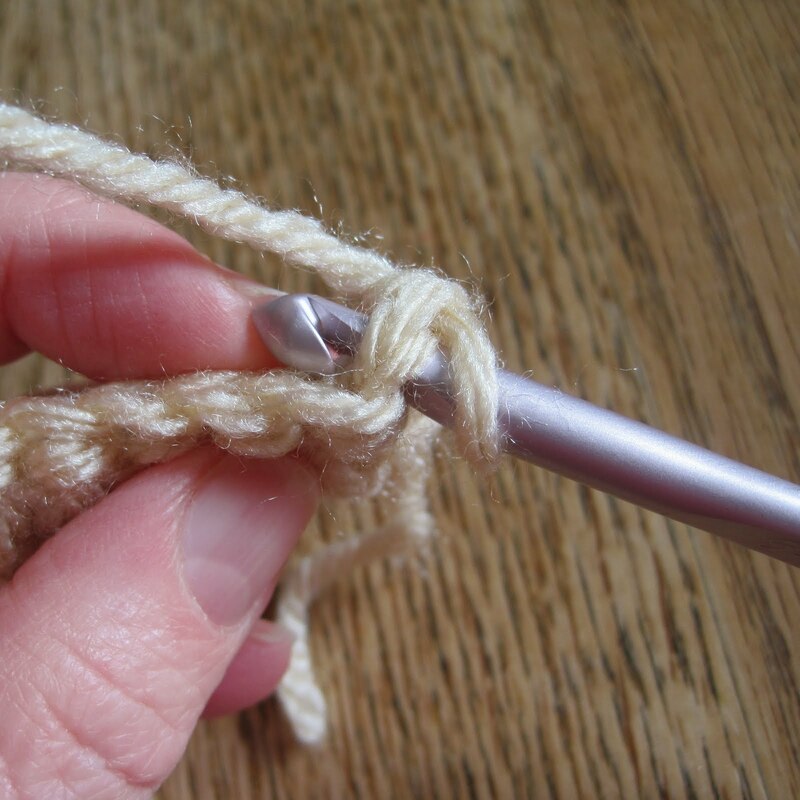 You finally wrestle your hook through to make the last stitch - and now there's a gap at the edge of the row. The chain-3 is just too skinny - there's no way it can pass for a double crochet. One is to pull up a very tall loop of yarn and use it to make a standing double crochet (click here to see a video demonstration by TXCr1cket). 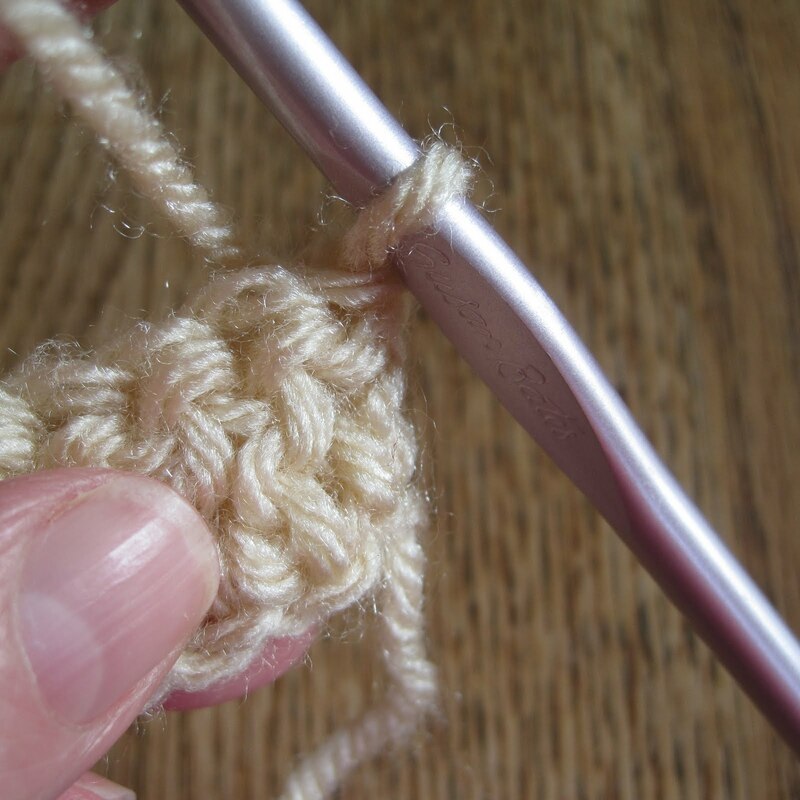 Another is to make a stack of single crochets to the desired height, as demonstrated in this video by Bethintx1. 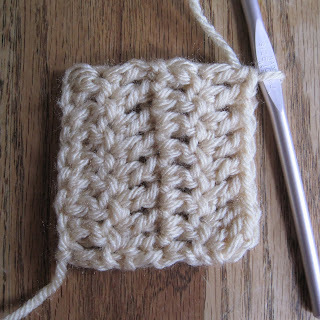 I like to use a variation of the second method - I'll call it a Foundation Turning Stitch (since it reminds me of foundation single crochet). 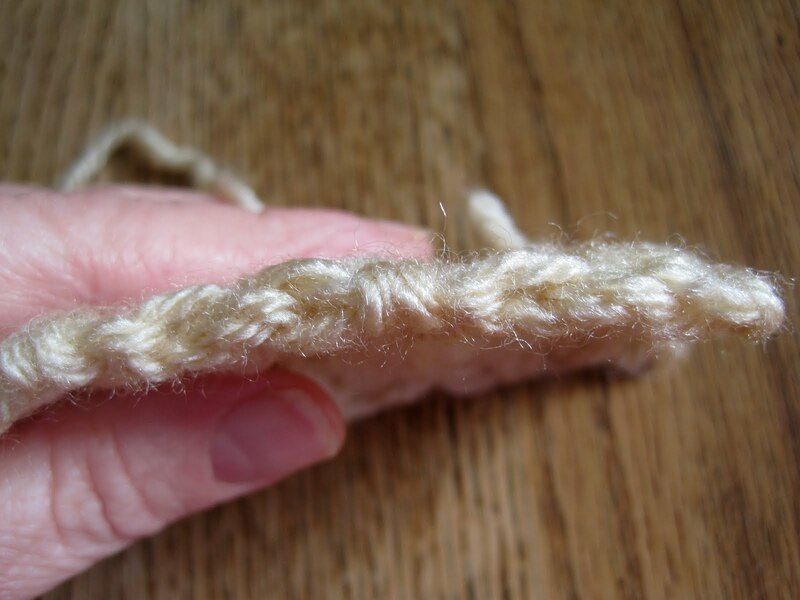 The Foundation Turning Stitch works equally well for half-double or double crochet, yielding straight sides and, more importantly, a nice normal stitch at the end of each row - no more fumbling with tiny turning chains! At the end of the row, turn, but DO NOT CHAIN. The working yarn should be behind the work. Keep your work loose and your loops a little larger than normal. Step 1. Insert hook into first stitch of row, front to back. Pull up a nice roomy loop. ...yarn over and pull through both loops on hook. 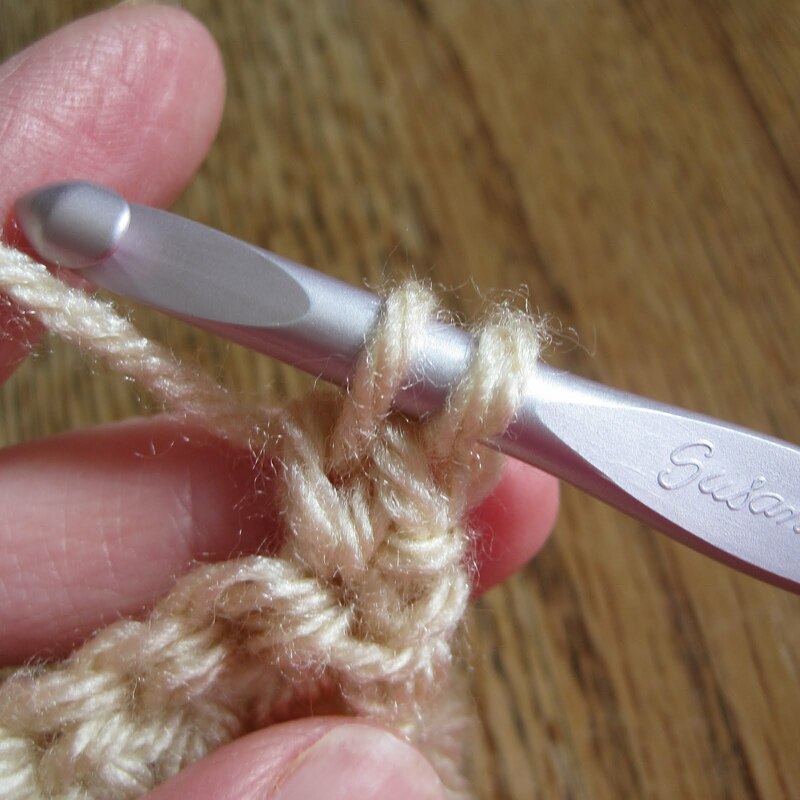 Don't let go of that strand of yarn just yet - you'll be putting your hook under it in the next step. Step 2. Insert your hook through the two left "legs" of the stitch (marked with dots below). The yarn you're pinching is the back leg. You can let go as the hook goes through. Yarn over, and pull up another nice roomy loop. Yarn over, and pull through both loops. That's it! Now you have a normal stitch to work into at the end of your row. 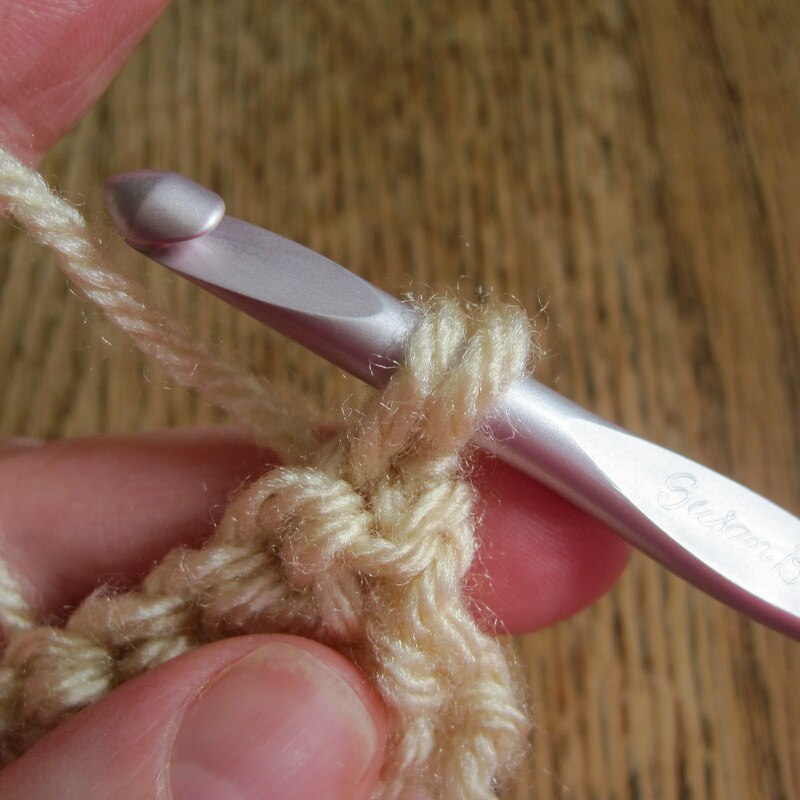 The foundation turning stitch is also very easy to work into if you want to add a border - lots of loops and spaces, with no knobbly knots. This stitch works perfectly for half-double crochet, too - just tightening or loosening the tension makes it very versatile. P.S. You can make the Foundation Turning Stitch even taller if you like, by repeating Step 2. You make it look so easy! And, indeed, the sides are so nice and straight! Brilliant! Oooh, thank you for this. I don't like the gap you get with the ch3, I'll try this out when I do the second half of the cushion cover I've got on the go. Fabulous. I've sometimes used the big loop standing dc, but I had not heard of the double sc method, and I love your variation. I'll have to try it as soon as the cast comes off! Oh my! I never knew that there were options. I will be trying that today on my little practice ripple. Might take me half of forever to get the hang of it. Well, that's blinking marvelous, and the first time I've ever understood an explanation for sorting that out. Nice clear instructions and pics too. Cheers! I'll be trying it on a cardigan I'm making at the moment. Oh my, this sounds wonderful. Will I have enough sense to do it? I doubt it, but I will try. Thanks for the photos and the info! Have you seen the "Mencap" blanket on SIBOL's website? I made 2 of the squares, one of them is of Stone Mountain! Thanks for the great tutorial. I just have one question. If the pattern says chain 4 (3 for dc and 1 ch) would I do a ch 1 after your method? Great tutorial! I have mastered the FTS but how do I get rid of the ch3 gap when I started with regular foundation chain? I know I can do a foundation dc row but that doesn't work with certain patterns. Now granted, the gap I'm describing is nowhere as big as the following ch3 gaps I guess because its edge is rounded and "leans/gathers" toward the left. So, do you KIM (keep it movin') and not worry about the initial ch3 created by the chain or is there another technique? You could use this technique with the starting chain too: instead of making your starting ch with 3 extra stitches and dc-ing into the 4th ch, try chaining the exact number you need. Keep the working loop loose, and insert your hook into the last chain, and make the FTS from there. 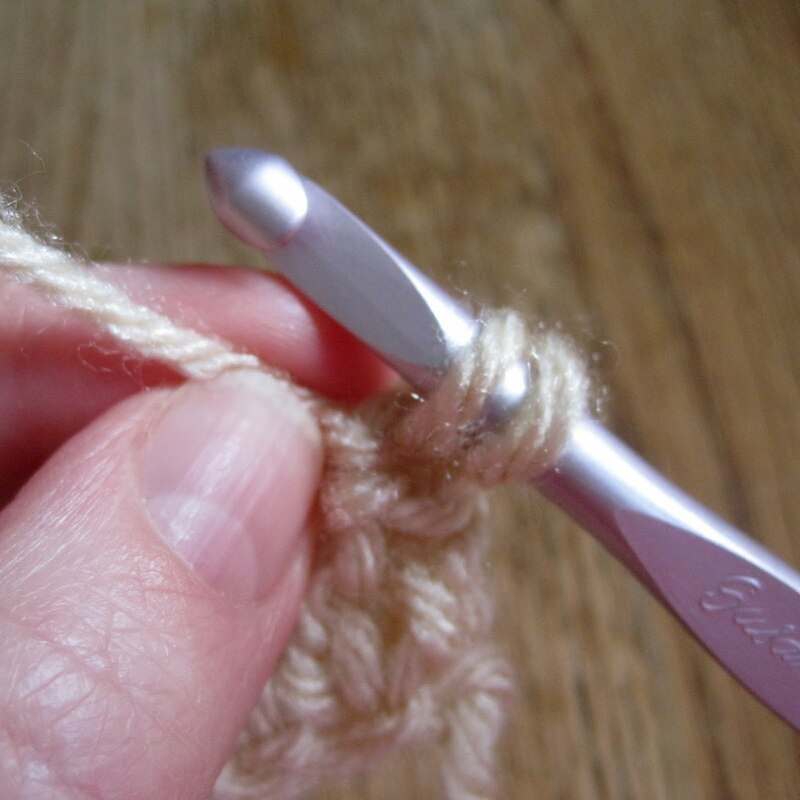 Another way would be to use a linked double crochet at the beginning of your row. Make the starting chain plus 3 extra stitches (the 3 extra count as a dc). Instead of yarning over for the next dc, insert hook into back loop of second ch from hook, yo and draw up a loop (this replaces the yo). Then insert hook into 4th ch and complete the dc. One more question...what about the dreaded ch3 in the round? Any technique to avoid the seam or ch3? So far, if I am working with dc, I just make an extended dc as my ch3, and make 2dc in same st w/the extended dc. At the end of the round, I skip the extended dc and join to the first real dc. Why 2 more stitches there? Well, when I join to the "1st" dc, it snugs up the post of the extended dc so your eye doesn't notice it as much...hope that makes sense. It's doable and not as noticeable as the ch3 but it can leave a slightly larger hole with three stitches. I did use this technique but it's a lot of work. Disregard my last question about the seam in the round. I found your comment to someone else on the Invisible Join tutorial. This is simply brilliant! Thank you so much for sharing. Is there a video tutorial somewhere? I am having a hard time visualizing the part where you hold the working yarn & remain holding it. I hate the dreaded gap and hope to conquer this method. Thank you! There's no video for the technique I demonstrated in this post - BUT if you look at the tutorial for the Floating Single Crochet stitch used in the Northern Shadows Cowl (link below), you can see photos and a video of something very similar. The link to the video of the Floating Single Crochet stitch was perfect. I totally get it now. Thank you! Years later and this page is still getting use. The thing is, I never even thought to think of an alternative to a 'turning chain'. I just figured I had to do it and that was that. And to be honest I avoided any stitch that required this because my edges NEVER turn out. I was stuck making Granny Squares and the like, which are fun but get boring after awhile. Thanks so much for sharing this. So helpful! This is awesome! "The happy momentum comes to a crashing halt as you poke around in the turning chain, looking for the right place to put your last stitch." Wow, I honestly thought I was the only person who had this problem. So happy to know I'm not! Thanks for your alternatives! What if I want to do this as a part of a decreasing row where I'm supposed to combine the chain and the next stitch together? In that case I would do one of the following things, depending on how they worked for the specific project. 1. Turn (do not make a turning ch), sc into the first st, ch 1, dc into the second st. At the end of the row dc2tog over the last 2 sts. (The sc + ch1 make up the first half of your starting decrease.) 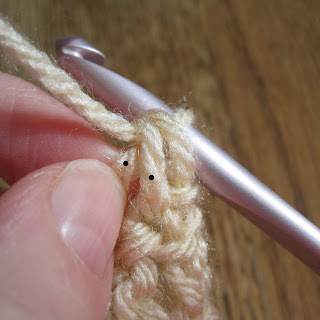 This technique works best for hdc or dc stitches - anything shorter or taller won't look right. 2. 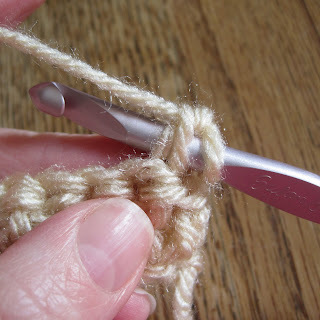 Place your decreases 1 or 2 stitches away from the edges of the row (then you can make the edges however you like). 3. Use a variation of Tara Murray's method as referenced above (see my reply to "D" a few comments up, and follow the link to the "Mamachee" blog): Make a ch-2/dc cluster, spanning the two starting stitches you need to decrease - the ch 2 would be your turning ch, then you'd skip a st and dc into the second st of the row. (If your stitches are not dcs, just ch 1 less than you normally would for that stitch height to make the cluster). Then end the row with a dc2tog (or ? ?2tog - whatever the stitch is) over the last 2 sts of the row. Repeat on each row, being careful not to work into any of the turning chs. This should give you a very smooth decreasing edge. If you don't like the gap formed by the turning ch and the skipped st, you could work the turning ch, not counting it as a st, then stitch2tog over the first and second sts of the row, and stitch2tog again over the last 2 sts of the row. This will make the beginning of each row slightly thicker than the end of each row - but since they will alternate all the way up the project it shouldn't be a problem. 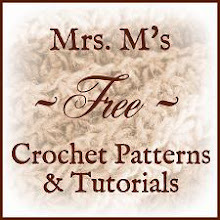 Yay finally just a simple tutorial with pictures, don't get me wrong I like to watch crochet videos but then i have to keep rewinding to make sure i did it correctly lol. Thank you very much! This is another method. The video is in Afrikaans, but it is simple enough to follow. Thank you for the link! That method looks very like TXCr1cket's method (see reference near top of post). Thank you! I am re-learning to crochet and turning chains were one of the reasons I abandoned crochet for knitting a couple of years ago. I'm eager to put this in practice on lap blankets and shawls for holiday charity knitting! I use this method on everything including in the round. I slst to join, pull the slst tight and then do this in the same stitch I joined in. I love it. I haven't used it in -hdc yet. Is it exactly the same process? Love this stitch. The edge looks lovely and it's easier than standing double crochet.